POLITICAL TIDBITS: Outrage over Napoles misplaced: as former senior gov’t officials argue, let’s put erring senators and reps on the carpet over scams. Will Ombudsman Carpio-Morales do an impartial investigation, given how she fudged the math at Corona trial? New party-list Rep. Lito Atienza bats for suspension of PDAF to show House sincerity and review disbursing system, but Boyet Gonzalez rejects it---instead instructing reps to line up for their pork, now increased from total of nearly P25B this year to P27B in 2014. Outrage over Napoles misplaced: as former senior gov’t officials argue, let’s put erring senators and reps on the carpet over scams. Will Ombudsman Carpio-Morales do an impartial investigation, given how she fudged the math at Corona trial? 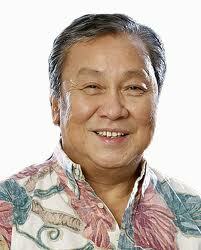 New party-list Rep. Lito Atienza bats for suspension of PDAF to show House sincerity and review disbursing system, but Boyet Gonzalez rejects it---instead instructing reps to line up for their pork, now increased from total of nearly P25B this year to P27B in 2014. There is so much public outrage over pork barrel that went to bogus projects and organizations, as facilitated by Janet Napoles, but the outrage is MISPLACED. To be sure, we citizens have the right to get furious at Napoles, but we ought to really get MORE FURIOUS at members of Congress who conspired with her wicked plot. If Janet Napoles didn’t exist, there would be others by different names who will still have the devilish ingenuity to cook up such schemes (recall how various types of pyramid scams intermittently crop up to victimize gullible folks). But with so much poverty among their constituents, our honorables in Congress should have had the moral strength and integrity to resist such tempting schemes. But they failed, aided by a system of frightfully loose accounting of public funds and the padrino system. COA Chair Grace Tan-Pulido has promised to provide the nation a thorough picture of the pork scams and name names, but until now she hasn’t done so; it’s easy to imagine the pressures being applied on her to just keep quiet. But out there must be others who had succeeded with their own con games---Janet must be just the tip of the iceberg. There is now public clamor for the Senate to put Napoles on the witness stand---they way they grilled the late Defense Secretary Angelo Reyes, Generals Carlos Garcia and Ligot, and Chief Justice Renato Corona. The public now wants Napoles to get out there and testify and the Senate is under pressure to summon her. But what kind of pressure would work on that chamber? DSWD Secretary Dinky Soliman was quoted earlier as saying she has ordered a check into pork barrel-funded projects of the 421 NGOs or civil-society organizations (CSOs) that DSWD has accredited. 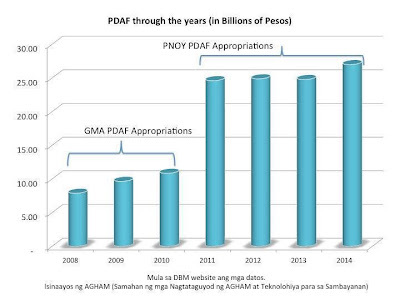 But if the Conditional Cash Transfer (CCT), or 4-Ps as they know it at the grassroots--- this year amounting to P45B but being increased to P63B in 2014--- is a good gauge of Dinky’s organization set-up, then we can fear the worst for many of the 421 NGOs and CSOs that DSWD is funding. I’ve never seen such a gargantuan-budgeted national government program as loosely run and inutile as the CCT---so much good money being thrown after bad, but with poverty ever-ascending DESPITE the many billions doled out. Given the gargantuan CCT set-up, how can Dinky police 421 organizations? The FSGOs rightly stress that these members of Congress are not “political neophytes” and “They, and we, were not born yesterday.” Meaning, these honorables knew about the devilish schemes they were being seduced with (in 70-30 or 60-40 sharing schemes). These FSGOs are asking the Ombudsman to investigate the grave abuse of the PDAF, and the senators and representatives implicated “to clear their names” by voluntarily subjecting themselves to an impartial investigation by the Ombudsman--- to determine the extent of their actual involvement. They also ask the President to constitute a special committee composed of representatives of the DBM, DOJ and the private sector to review the PDAF process and recommend safeguards to ensure that it's not further abused. This is all well and good but I have a couple of misgivings that doubtless many citizens share. One is whether Ombudsman Conchita Carpio-Morales would conduct a truly impartial investigation that would let the chips fall where they may. My doubt is due to the fact that she has shown herself to be so dog-loyal to the power that appointed her. I cite as specific fact the way Ombudsman Morales, whether by sheer ignorance or willful machination, fudged the numbers in Chief Justice Renato Corona’s bank accounts during his impeachment trial last year. Morales made each dollar deposit of Corona appear as new account, so that the total reached a mind-boggling $10 million, she huffed in a power-point presentation. It turned out that Corona’s actual total deposits, as he himself later testified and banks ascertained, amounted only to less than $2 million, that included the wealth of his wife and which were covered by the Foreign Currency Deposits Act. The way I saw it then, it was not innocent error on Morales’ part, as she is far too intelligent to commit such mistake. 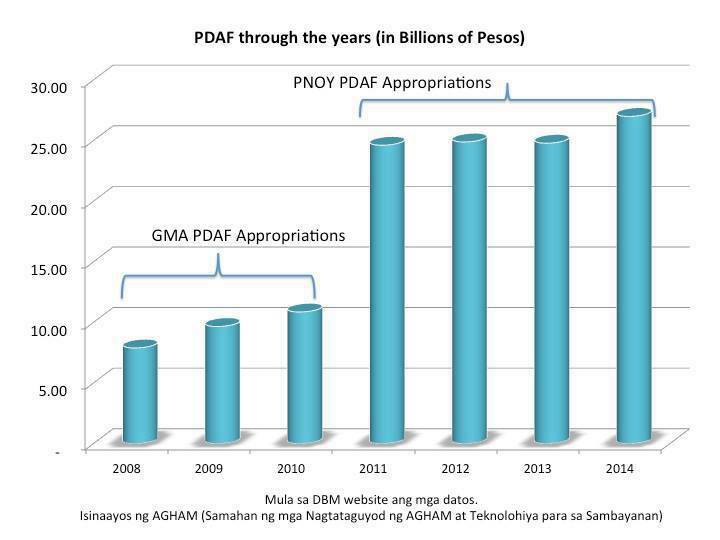 With regard to the FSGOs' plea for P-Noy to constitute a special committee led by DBM and DOJ, to review the PDAF process, it should be noted that DBM is the key agency in the pork barrel scam as it’s the releasing agency; but it failed to scrutinize the legitimacy of the selected NGOs. Moreover, while a lot of members of Congress involved in the scams dated from the GMA era, there undoubtedly are those in the current administration allied with P-Noy and his LP, now deeply involved in the fund mess. Would he move against them and risk losing their support---to the point that they might impeach him? Note that P-Noy quickly differentiated between those involved in the scams and those who used their PDAF 'judiciously'---even before the NBI could finish its investigation. It should also be stressed that he increased this year's pork barrel funds for Congress from a little less than P25B this year to P27 billion next year. In fact, P-Noy in his first three years and for 2014 has more than doubled the pork barrel that GMA allotted for Congress. Note also the allegation that Napoles contributed P100 million to the LP campaign in the last elections (totoo ba ito, Senate President Drilon? You were LP campaign manager in the last elections. Your silence is deafening). Given such background, how can the Ombudsman do “impartial” sleuthing? Take a look too, at the House that’s controlled by the President’s men and the siege mentality they're displaying. New Buhay party-list Rep. Lito Atienza recently delivered a privilege speech asking the House to suspend the implementation of the PDAF in order to make the chamber “look more responsive” to the people’s outrage over Napoles. Atienza also argued that this respite would give its members the opportunity to review the PDAF system and tighten screws, in order to avoid a repeat of the scandals. Earlier he made known on the floor his intention not to accept his pork barrel, something he said he had promised on the campaign trail even before the scandals erupted. But Majority Leader Neptali Gonzalez, Jr., immediately thumbed down Atienza’s proposal and stressed that the latter could deliver as many privilege speeches on the issue as he wants (to cool down), but there’d be no change in the system. In fact word was passed on to House members that they could already sign up for their new PDAF. Leaders of both chambers of Congress want to just entrust the investigations into the pork scams to the NBI. But given the way investigations go in this country, this could take an eternity. Obviously the aim is not to widen the scope so that folks would forget, as the nation lurches on to another crisis.